There are several mistakes in the names and birth dates on this family's census form. 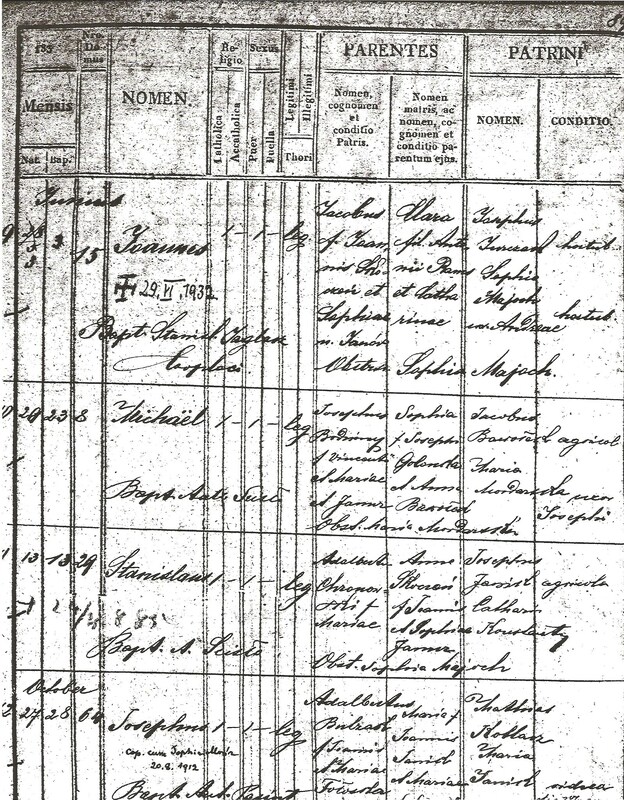 Several of the names are spelled incorrectly, and the enumerator failed to note that Clemens ('Clarence' on the form) was Joseph's stepson (who had a different surname). Also, I have located county probate birth records for every member of this family, and the only date of birth that is correct on the census is Frank's, who was born only a few months before the census was taken. The enumerator did correctly record the couple's number of years married at six years; according to Joseph's obituary, they were married 4 Apr 1894. In the modern-day map below, Joseph's land would be located in the rectangle between Amsterdam Rd, Wilker Rd, OH-274, and Mercer-Auglaize Co Line Rd. His land would have been about in the middle of that rectangle. Map below showing Auglaize County. The purple circle indicates the location of German and Jackson Townships. Bodziony was the maiden name of my paternal grandmother, Veronica Bodziony Kowalski. She was a child of two Polish immigrants, Michael Bodziony and Sophia Krupa, who settled in Cleveland, Ohio. In 1883, Michael Bodziony was born in the village of Świniarsko, a few kilometers away from the larger city of Nowy Sącz (see map below). At the time of his birth, this area, which has been ethnically-Polish for centuries, was part of the Austria-Hungary Empire. When you first read the name 'Bodziony,' I don't think you immediately think of it as a Polish or even a Slavic surname. Even today, it's not a terribly common name in Poland, and the highest concentration of the name is still found in and around Nowy Sącz County, Małopolska Voivodeship, which is on Poland's southern border with Slovakia. The map below was generated by the website Moikrewni.pl, which literally means "my kin" in Polish. It shows the relative distribution of the surname Bodziony throughout modern-day Poland. According to Worldnames Public Profiler, which compiles surname data from modern telephone directories and voting registers, the surname Bodziony has a frequency in Poland of 42.8 per million. For comparison, the surname Kowalski, which is a very common surname, has a frequency of 1847 per million. Not surprisingly the frequency per million in America is only 0.47. So, what does the surname Bodziony mean? According to good old Google Translate, the Polish word bodziec is a noun which means 'stimulus' or 'incentive.' I asked the native Polish-speakers in a Facebook group, and one person told me that the name has the same root as the word bóść, which is a verb meaning 'to gore.' I think its relative infrequency tells me that it probably doesn't describe a profession, as a lot of surnames all over the world tend to do. The surname could possibly be a reference to a place name. There is a town by the name ofBodzanów about 70 kilometers to the northwest of Świniarsko. (There are actually several villages with this name around Poland, but this one is the closest.) There is a also a town farther away in Świętokrzyskie Voivodeship, (north of Małopolska Voivodeship) known as Bodzentyn, which has been around since the 1300s. So, it's possible that the family name originated as a way to tell other people "this family is from Bodz... village." I do have evidence that the name was NOT changed when Michael came to America - the name shows up fairly frequently in the 19th century Roman Catholic Church records of the Diocese of Tarnow. The Bernard Family was from the small town of Réchésy, located in eastern France right on the border with Switzerland. According to his children's birth records, Leon worked as a shoemaker (cordonnier) in the village. Last year, when I was working on creating my genealogy map wall, I bought a early 20th century postcard depicting Réchésy. I recently stumbled upon this modern photo of Réchésy (below) on the Panoramio.com website. (Photographer is Mr. Yves Bamberger.) The perspective of both photos is very similar, and it seems as if the village has not changed too much over the centuries. This French Wikipedia page for Réchésy lists population data for the village, starting in 1793 and continuing to 2011. In 1793, four years after the birth of Leon Bernard, the population of Réchésy was 606. It appears that the population grew to 1200+ in the 1880s, but declined in the 20th century. Today there are approximately around 800 people in the town. The church pictured is L'église Saint Jean-Baptiste. According to this Réchésy heritage website, it was built around 1850-1860, when the population of the town started growing larger. So, this particular structure was not there when the Bernard family lived in the village, but there was surely some sort of smaller chapel/church were residents worshiped and received the Catholic sacraments. Oh, what I wouldn't give to be able to stumble through this cemetery on the hillside! And this screenshot below may actually be my favorite, because of the 'Beurnevesin' directional sign. According to Leon and Catherine's civil marriage record, Catherine Kilker was born in Beurnevesin, Switzerland, a small village located just a few kilometers from Réchésy. Way back in April, I wrote a blog post detailing a 'vision' I had for decorating one large wall in our home. I wanted to use maps, books, postcards, and other small pieces of artwork to tell the visual and geographic story of my and my husband's families, from their origins in Europe all the way up to the places where I and my husband grew up. It took several months, but my vision is more or less complete, and I'm so happy with the results that I wanted to share it with everyone, in the hopes that you may be inspired to do something similar in your home. As I mentioned in my April post, I started buying maps and postcards off of websites like as eBay and Etsy. I also found a couple of books and small pieces of artwork that help to tell our family's story. (Tip: Don't limit yourself to U.S. sellers only; I found many unique postcards and maps through international sellers.) Once I felt that I had a good representation of the various branches of our family tree, I looked into ways in which I could frame these items. I visited a local custom framing shop in town. Let's just say that their prices were WAY out of my budget. My heart sank; I thought my project was over. I started looking around online and found an Ohio-based company called American Frame. Their easy-to-use website takes you step-by-step through the process of measuring and ordering custom mats and frames. Oh, and did I mention that their frames and mats were affordable? My project was back on track! German map of the Balkan states in brown wood carved frame. 19th c. map of Polish Galicia in silver wood frame with blue mat. Map of Italy in blue wood frame. Map of Alsace-Lorraine in black carved wood frame and red mat. Map of NYC harbor in a smooth charcoal black wood frame. Map of immigrant ship routes in green wood frame. Not all of my frames were custom-ordered at American Frame; I bought a lot of the postcard frames at Wal-mart. I used self-adhesive photo corners to mount the postcards on scrapbook paper. Two vintage Cleveland postcards in 8x10 Wal-Mart frame. Postcard of husband's home church in 5x7 Wal-Mart frame. I knew that I wanted to display the framed maps and artwork on ledges, instead of hanging each frame individually. I wanted 4-6 larger shelves which I would arrange in two rows. The ledges HAD to have a forward 'lip' on them so that I could rest the frames on the shelf and not worry about them sliding off. I started looking around in some of the major home decorating chain stores and again I found that these shelves could possibly break my budget. And again, I took to the Internet and found a website called Exposures. The have a great selection of wooden and metal shelves and ledges in popular colors/finishes, and, if you sign up for their email list, they send you lots of coupons. Because I didn't want the shelves to be the focal point of the display, I purchased them in the white finish, which would blend in with our neutral walls and white molding. In hindsight, I probably should have purchased their 'extra-deep' shelves, because that would have given me a little more room on which to rest the frames - luckily, I didn't order any frames that were too deep, so the normal depth shelves ended up working fine for me. Here is a photo of the entire display. Many thanks to my husband for hanging the shelves. I did not originally intend for the old sewing machine to become part of the display, but it works, especially since two of my great-grandmothers were pretty good seamstresses. I actually think it would be cool to add a few smaller items to represent some of the occupations of some of our ancestors - maybe a plumbing pipe/valve for my grandpa, and a small blacksmith tool and toy tractor for my husband's ancestors. Postcard of hospital, book about my hometown, and vintage letterpress 'B,' representing my Grandpa Bellan, who worked in printing. Immigration ledge with books and vintage postcard of steamship in NYC harbor. German book about Lauterecken, Germany, one of my husband's ancestral villages. Originally, I had thought that I might like to paint the words 'Our Family's Journey' on the wall somewhere at the top of the display. Now, I'm not sure if I still want to try that, or if I will just leave it alone and let the maps speak for themselves. Either way, the whole thing makes me smile when I pass it by, and I can't wait until my kids are old enough to wonder "Why is that map there?" or "What is that book about?" And now I can show friends and family members what I've learned through my genealogy research WITHOUT pulling out a binder full of death certificates and census records, which would undoubtedly put most of them to sleep. Feel free to ask me any questions about the process of creating a genealogy history wall. I'd be happy to talk about it! After clicking on a photo icon: Jacobikirche in Coesfeld. Réchésy, France, husband's ancestral village. Theodor Tumbusch, one of my husband's gg-grandfathers on his mom's side, immigrated to America from Germany in 1861. His ship manifest is below. He was about 27 years old and his last residence is listed as Koesfeld (proper spelling is Coesfeld). Listed beneath him in the manifest is Anna Rasing, who was either already his wife, or who would soon become his wife upon arrival in America (I still need to figure that out.) They arrived in Baltimore and eventually made their way to western Ohio, where they settled on a farm in Mercer County. Unfortunately, Theodor died rather young in 1870; Anna lived until 1918. I've done some research on the surname 'Tumbusch,' and it's difficult to determine what the name means or indicates. 'Busch' in German simply means 'bush' in English and 'tum' might refer to several meanings. The English word 'tumble' has roots in German - the German verb 'taumeln' means to fall, drop, or stagger, and the verb 'tummeln' means 'to romp.' The German noun 'tumben' means 'tomb.' The German noun 'tumult' has essentially the same meaning as the same English world and the noun 'tumultant' refers to a rioter. So, maybe my husband had an ancestor who fell in bushes or who was buried in bushes or who caused some sort of commotion or uproar in bushes. Your guess is as good as mine. Theodor Tumbush had three sons, Henry, Bernard, and Herman, all of whom lived into adulthood and had sons of their own to carry on the family name. It appears that most of Henry's children chose to change the spelling of the name to 'Tumbush' - their birth records indicate the original spelling, while military, marriage, residential, and death records are most often without the 'c.' As far as I can tell from the records, the children and grandchildren of Bernard and Herman kept the original spelling. If you're not one of my in-laws and have never heard the name 'Tumbusch' before, you're not alone. It's not a common name. The Worldnames Public Profiler maps surnames for 26 countries around the world using recent telephone directories and voter registries. It is not scientific or completely comprehensive, but it still gives you a good idea of relative popularity of a name in different places. In the U.S, the frequency per million (FPM) for the name Tumbusch is only 0.41 (The Tumbush spelling is 0.25). By comparison, my surname, Kowalski, which is basically the Polish equivalent of Smith, has a FPM of 81.56. And Tumbusch is actually MORE common in the U.S. than in Germany, where the FPM is only 0.09. Zooming into Europe: It is a little difficult to see, but the only area in which 'Tumbusch' is found is the German state of North Rhine-Westphalia, which is where Theodor's hometown of Coesfeld is located. Breaking down the United States: Tumbusch on the left and Tumbush on the right. Not surprisingly, both spellings are relatively common in Ohio compared with other states. And, finally, Ohio by county, Tumbusch on the left and Tumbush on the right. That county in western Ohio in the darkest shade of blue is Mercer County, where Theodor and Anna orginally settled. Notice the small concentration of Tumbush near Cleveland. One of my husband's great uncles moved to the Cleveland area to work on the railroads in the early 20th century and I am willing to bet that some of his descendants still live in the area. Based on the rarity of the name, it is probable that many people with the surname Tumbusch or Tumbush in the United States today are descendants of Theodor Tumbusch. And if there are any Tumbusch's out there who AREN'T of his lineage, it would be interesting to try to trace back their ancestors to Germany to try to find the common ancestor. That may have to be one of my longer-term goals for the future. In the meantime, I'm adding Coesfeld, Germany to my list of must-visit places whenever my husband and I get a chance to take our genealogy trip to Germany. The other day, I found a website called WhatWasThere.com. It overlays historical photographs onto present-day Google Map streetviews, so that you can "see" what places looked like in the past. The database includes photographs and streetviews from all over the world. I could easily waste hour after enjoyable hour browsing through this website. The homepage gives you the option of entering a city, state, country name, or zip code. At any point, you can easily zoom in or out using the scroll button on your mouse. Click one of the little orange bubbles, and a sidebar pops up showing you which photos are available for overlay. Click on any image in the sidebar, and it will pop up on the map. Then, you have the choice of "View Photo Details" or "Google Street View." It's definitely a fun interactive map to play around with, especially if you are interested in geographic immigration trends over time. Check it out!